This photo finds me out for a hike in the backcountry located along the eastern slopes of the Alberta Rockies. In my hands is my Kenwood D72 that is kicking out beacons being digipeated by my mobile located several kilometers away. 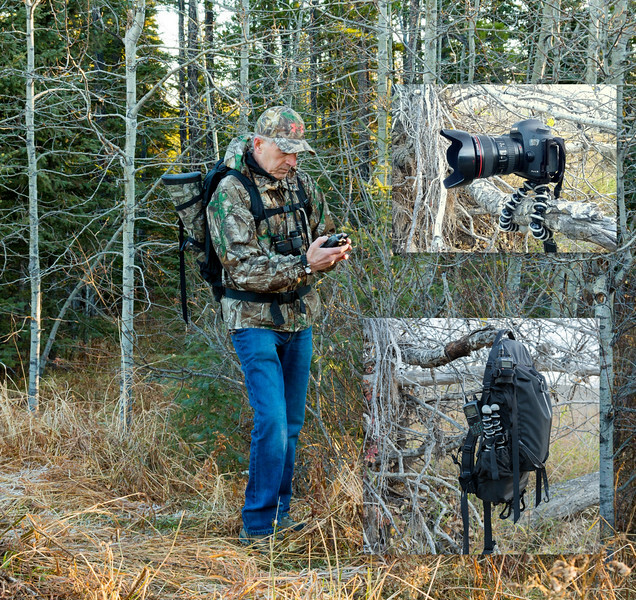 In case you were wondering how I photograph myself in situations such as this one, I have my camera mounted on a Joby Gorillapod Go-Go Tripod, a tripod that is only about a foot in length with flexible ball type jointed legs allowing the tripod legs to be wrapped around a tree branch. These tripods will easily handle the weight of a DSLR camera with lens as seen in the insert photo. They come in various sizes, the size depending on the camera you wish to mount on the tripod. When I am not using it, I store the tripod on the side of my pack as seen in the lower insert photo. The other device I use for triggering the shutter is a RFN-TX wireless shutter release. The RBN-TX consists of two units, one that can be mounted in the hot-shoe of the camera and is connected to a electrical port on the side of the camera. The other unit has a lanyard that allows me to carry it around my neck if desired. When I want to fire the camera, its as simple as pressing the button on the wireless shutter release device. The RBN-TX has a 100 meter range, so it can also be used for other reasons, such as setting up the camera near a nest with skittish birds that will not tolerate your presence near their nest. With this device you can stay way back and fire the camera remotely. The RBN-TX device also allows for auto-focusing and mirror lock-up before the camera fires.